LONDON - Labour has announced the winner of its "crowd sourcing" competition, which it launched last month in an attempt to get its supporters involved in devising election campaign ideas. 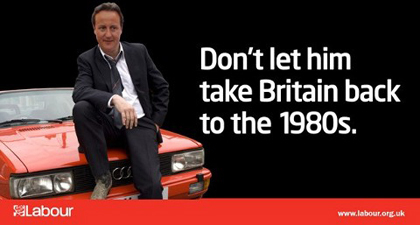 The winner, 24-year old Jacob Quagliozzi from St Albans, devised a poster depicting David Cameron as the 'Ashes to Ashes' character DCI Gene Hunt, along with the headline 'Don't let him take Britain back to the 1980s'. Quagliozzi's idea was chosen from more than 1,000 entries that were submitted in the three days the competition ran. 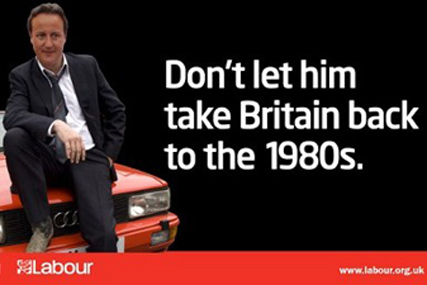 Labour's ad agency, Saatchi & Saatchi, then brought the idea to life in the form of a poster, which was launched on Saturday by Cabinet ministers David and Ed Miliband. The party has also seeded a video on YouTube of Quagliozzi visiting the Saatchi & Saatchi offices in Charlotte Street. 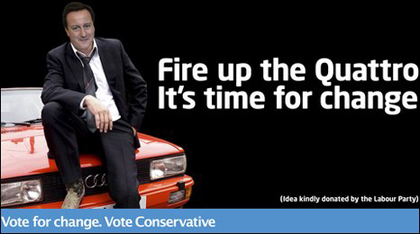 However, just 24 hours after the poster launched on Saturday, the Conservatives' ad agency Euro RSCG responded with its own version of the ad, which featured the same image but altered the strapline to 'Fire up the Quattro, It's time for change'. A single line in brackets underneath said 'Idea kindly donated by the Labour Party'. Cameron was reported to be flattered by the comparison to Hunt, and yesterday launched the next spot in the Conservative's election campaign, created by M&C Saatchi, which featured an image of a pair of boots trampling on green shoots emerging from the ground. 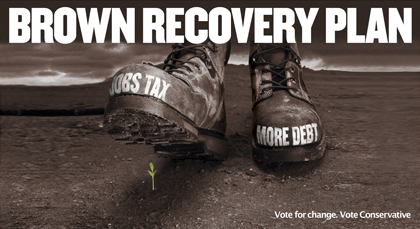 The boots are labelled 'Jobs Tax' and 'More Debt', and are accompanied by the headline 'Brown Recovery Plan'.